An Original Series of Acrylic Paintings by Alan Pomeroy called What Price? After visiting spiritual sites in Italy, Croatia and Turkey, the importance of, and the reverence for, the big issues of life and death were inspirational. How these issues were represented in churches, cemeteries, public sculptures and even retail souvenir shops was the subject for these two paintings. 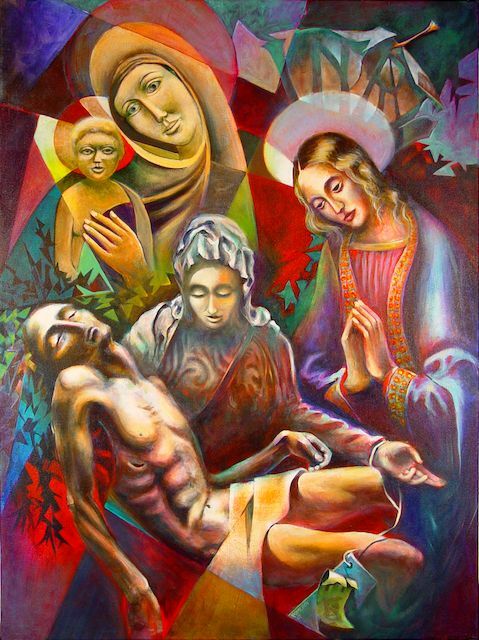 Churches in Italy inspired the Pieta image, which is the artistic representation of the Virgin Mary while she is mourning over the dead body of Jesus Christ, and also the two versions of Virgin Mary and child, all shown in the painting. The different styles deliberately reflect the source images and are juxtaposed to reinforce the theme of life and death. The price tag on the Pieta reflects both the sale of this image in shops and its theme. A cemetery in Croatia and a sculpture in white marble in Turkey inspired this painting. 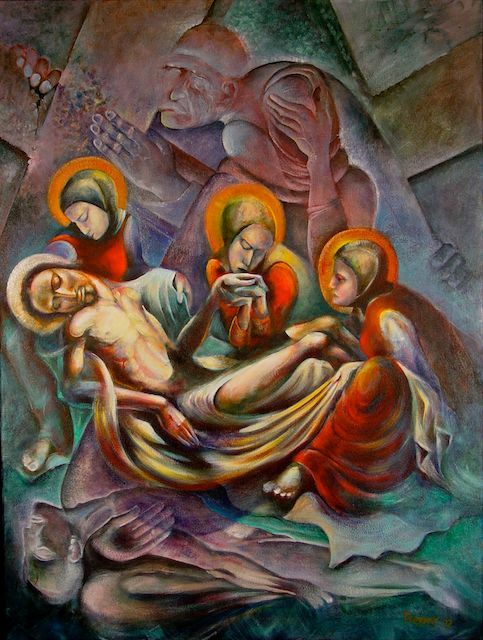 The Pieta in the foreground (from a crypt painting) showing the Lamentation of Christ and is set against an indented background sculpture that represents the impact of war on people in Turkey. This theme of lamentation and price/cost of war obviously applies to all people in all war-torn countries.